The dining options at Disneyland can be overwhelming. From quick service to character meals, and everything in between, there is something for everyone and every budget. Check out these ten don’t miss Disneyland Restaurants below. Deciding where to eat during your Disneyland vacation can be overwhelming. We are here to give you 10 great picks on where to grab your next bite. Best yet, we are making sure to include something for every budget. Oh my goodness, this place is so good. Seriously, it is probably the most delicious food I have had in as long as I can remember. I haven’t been able to dine here in a few years, but I hope to get back our next trip. This restaurant is located inside of the Grand Californian and is in the higher price range (plan on $50-75+ per adult). I don’t know how they make the food so full of flavor at this restaurant, but I need to find out. One good thing about this restaurant is that since it is in the Grand Californian Hotel and Spa, you do not need park tickets to eat there. The atmosphere of this restaurant is one of a kind. You dine inside the Pirates of the Caribbean ride. 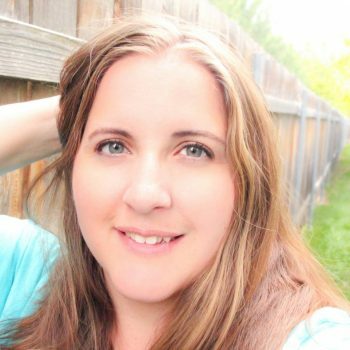 You feel like you are outdoor on a patio, next to the lake, with lanterns above you, but you are inside. The food is delicious too. Located in New Orleans Square, it is only fitting that Blue Bayou serves some amazing Cajun-Creole Cuisine. This is another pricier dining option, so you can plan to spend around $50 per adult. If you like seafood and princesses, this is the place for you! This restaurant is located in Disney California Adventure (DCA) on Paradise Pier. Step inside and you will go under the sea with Ariel and some of her princess friends. If you are not a seafood lover, but still want to dine with the princesses, don’t skip eating here. There are plenty of non-seafood options on the menu. 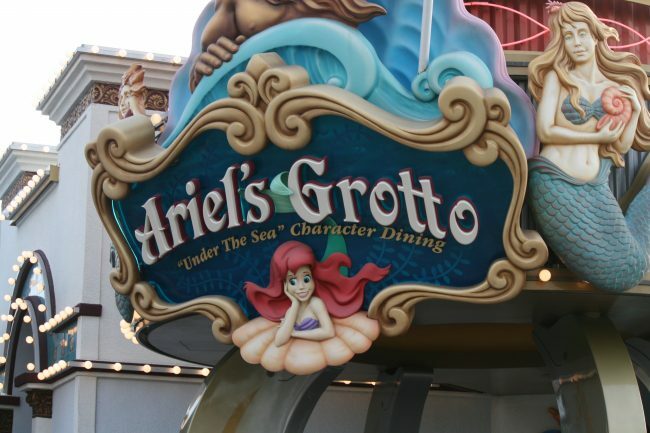 Ariel’s Grotto is the last place we will feature that is in the higher price range. You can expect to spend between $30 and $75 per guest. If you love Italian food, have a large family, or just love pizza this is a great place to get lunch. The Pizza and Pasta here are great, and the restaurant is really affordable. We normally get pasta and a pizza and we all share. We fed 5 of us for under $50 (2 adults and 3 children). We were all very full and everyone thought it was good. This is a great place to eat in the park, even if you are on a tight budget. If you want a deluxe dining experience inside the park, Carthay Circle can’t be beat. 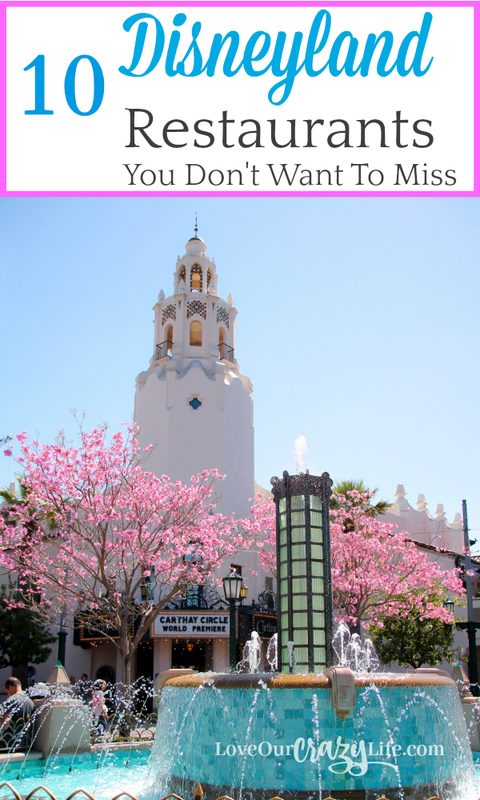 But honestly, the reason I love Carthay Circle is for the dining packages it offers for both World of Color and Frozen Live! You get amazing food, plus reserved seating for the show of your choice. Carthay Circle is quite spendy and you will spend between $25-$75 per person depending on what you order. 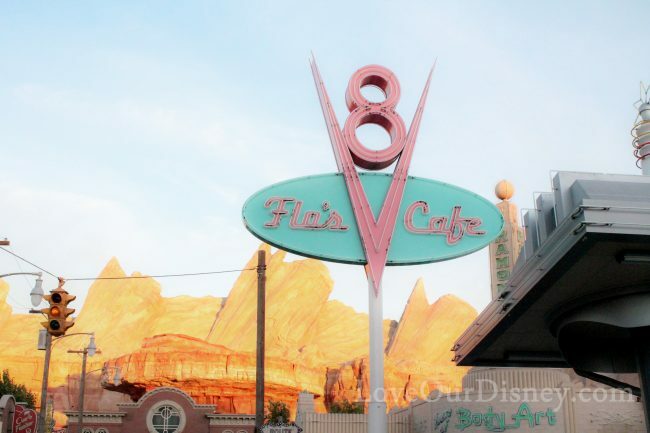 Located in Cars Land in DCA, Flo’s is a fun, quick service restaurant. Flo’s is a 50’s style diner, clear from the name to the decor. The milkshakes here are amazing! I also love to head over to the patio and sit and watch the cars race around Ornament Valley in Radiator Springs Racers. Flo’s is moderately priced. You can expect to pay around $10-$15 per guest. I love the Plaza Inn. First off, it is home to my absolute favorite character meal, Breakfast with Minnie and Friends. While you can join Minnie for a breakfast buffet and some meet and greet fun, don’t discount this location for dinner. One reason I love Plaza Inn for dinner is their meals can easily feed two people. The fried chicken is delicious as well. You will spend about $15-20 per platter for dinner. 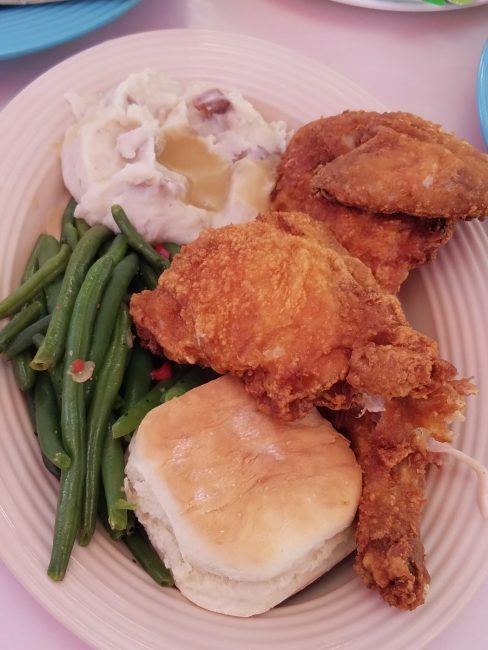 The Plaza Inn Chicken dinner is HUGE! This one is the Goof’s favorite place to eat. They have some good food (including some amazing funnel cakes). The Goof loves their chicken nuggets and fries kids meal. The food here is served in pretty good size portions. The Goof and I can share a kids nugget meal here and we are both feel full after. The price isn’t bad either. You will spend about $10 per person. The stage door cafe is located across from the Rivers of America. Across from the Haunted Mansion by the Rivers of America you will find Harbour Galley. Here you can get some filling, delicious meals. Our favorite here is to get some Clam Chowder in a bread bowl. So yummy and so filling. The price is around $10-$15 per adult. Pretty good for a meal that is sure to fill you up. If you want some Cajun-Creole Cuisine, but the Blue Bayou is a bit out of your price range, check out the French Market. We found the food here to be quite good. Located in New Orleans Square it is a perfect fit for the land it is located in. You will also love the music. The price is around $15 per adult. It was definitely hard for me to narrow it down to 10 Disneyland restaurants, especially when wanting to spread the love between restaurants that will fit every budget. There were a lot of others I would have loved to include. Do you have a favorite Disneyland restaurant that did not make this list? Share it in the comments below.